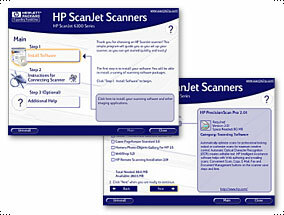 In order to streamline the installation process and reduce telephone calls to HP Customer Support, a CD was created that ships with HP ScanJet Scanners. By using the installation CD, new scanner owners can install HP and third-party software from a single program, view an instructional video, and gain access to help files and technical support. Information was architected in an extremely intelligent and logical manner and reinforced with a very intuitive graphical interface. The program was localized in more than a dozen languages. This application also received a patent upon which Laurie Anderson is named.